Are you a ‘to do’ list person? I set myself reminders on my phone and make lists in the notes app. I write bullet points in a notebook, stick neon notes on walls and chalk up chores on the blackboard. The determination is always there to get through it, to enjoy ticking things off. But frequently I find I am frustrated with myself about the things that have gone unticked as I get distracted from the plan. I include things I’ve already completed, or ridiculous items like ‘get the boys to school’ in order to redress the balance. But then I just feel bad about cheating – unlike Pastor Shep! Today I had a couple of reminders hanging over from yesterday and I woke up in a super energetic and upbeat mood. Half an hour after the boys had gone to school I had aced my list. So I kept going with no list. The chores are mainly (all) really boring. But somehow having the peace and space to do everything in its own time made it weirdly relaxing. So rather than beating myself about the head with reminders and ‘to-do’s I’m going to write an ‘I did…’ list from time to time and remind myself how much I achieve, however small and whether for others (much much washing in my life) or for me when I acknowledge the importance of taking time out for me and being glad of that. …begin the day watching the sunrise on the beach. I meditated (badly) and swam (not very far). …make a green juice that all the boys drank – mum win! …reply to the emails I’d been putting off. …listen to a live lecture of the course I’m taking (usually I manage a recording if I’m lucky). …stew the plums that looked like they’d been forgotten at the back of the fridge. …prep supper during the day – something I always mean to do but never manage. …four loads of washing. And dried, folded and put them away. Felt great! …apply liberal amounts of aftersun to my poor sunburnt body! …not get to yoga because of the sunburn, silly me. …make a phone-call I’ve been putting off. …sit and enjoy a coffee while reading a new book at my fave cafe. …take a book back to library on time. …send out four pitches to editors (fingers crossed!). …not drink any of the wine I was putting in the risotto. …not make up an excuse about missing an ingredient in order to buy wine. …sit and eat supper with my beautiful sons. …read with all of them before bed. …have a really early night. …thank the universe for having my back today. Let me know how and if you write lists. Share your ‘I did’ list! Sorry, you’ll now have that in your head all day! Allowing the apron strings to fray. Like many mums, the apron strings between myself and my kids have always been tightly bound and double knotted. They are growing up far too fast and every day I wish I could stop time, preserve them as my – mostly – delightful little boys. My eldest would definitely take umbrage at being called little but in my eyes he and his brothers will always display that kernel of babyhood, however tall and hairy they become. For years they are our shadows, having no choice but to be wherever we are, in the trolly while we shop, playing in the corner of the doctor’s room on the rare occasion we’re there for ourselves, in the creche at the gym while we claw back some ‘me’ time, even squashed into the cubicle of a public loo. Of course we know from the moment they are born that the day will come when their reliance on us will be at an end, the hope being that our efforts are rewarded with the emergence of a thoughtful, articulate, well rounded and capable individual. Knowing this makes the stark truth no less horrifying: ultimately I will no longer be needed. So I have decided to put myself into training. Independence will not be an overnight severing of the apron strings, more of a gradual fraying as the boys slowly start forging their own path in a organic way. I have always been guilty of doing things for them that they should probably be doing themselves since doing it myself is quicker and easier. Uniforms are put out the night before, I make their lunches, pack their bags. I’m sure it would teach them all sorts of life lessons were I to ask them to do these and many other pesky tasks of daily living but I know my stress levels would go through the roof. They are so easily distracted that it’s a battle just persuading them to put the damn clothes on most of the time. With a little planning I am changing things up. Before they go to bed their uniform has to be looked out, before the tv goes on in the afternoon their bag must be unpacked. I deliver a pile of clothes to their room and ask them to put it away. Baby steps. I used to walk them to school, delivering them to the gate with reminders and hugs. When I went back to work last year I began sometimes only taking them halfway, peeling off towards the bus stop. They were, of course absolutely fine. They stayed together, adhered to road rules, my eldest making sure the younger two stayed safe. It turned out he relished the responsibility and it wasn’t long before he suggested they could go all the way by themselves. The first time I followed them. Yup, I felt utterly foolish but somehow compelled to shadow them back as they had me for so long. These days none of us thinks twice about it and they are always raring to get to school for half an hour of playtime. The only stipulation is that they have to give me a hug first, something my twelve year old is unsurprisingly much more comfortable doing away from his mates – wins all round. The boys recently upped the ante when they suggested they could go and buy the milk we needed to save me a trip. That they also took their own money and added chocolate to their shopping made the experience all the sweeter! I came home from work one day to find they had decided to bake their own afternoon tea (my husband was working at home). Muffins and pancakes had been made and half the fruit in the house cut up. Hot ovens, open flames and knives, OMG what was my husband thinking? However there were no burns or cuts, just three very self-satisfied boys and a kitchen on which a flour bomb had dropped. With my eldest moving from primary to high school next year there is no doubt the time is absolutely right for him to be emerging from beneath my wings, his brothers following in his wake. The knots are still holding for now, just fraying ever so slowly. And at the end of the day they all still ask to be tucked in and once they’re asleep are still my delightful little boys. I remember when my youngest started school, “you won’t know yourself” was the common refrain. Of course rather than the inferred endless time to myself, I instead managed to fill my time with chores, as much writing as I could find motivation for and, I’ll admit, quite a lot of faffing about. It is a well-documented curse of our age that we all feel permanently run off our feet, pulled in different directions by myriad demands. This can then lead to a complete lack of appreciation for the things we are able to do once our children are out of the house for six hours a day. Like go to a yoga class, eat a sandwich while reading the paper, grab a coffee with a friend for an hour, make a phone call involving a call centre (have you ever tried this with children anywhere near you? It’s as though they have a radar alerting them to the most rewarding time to bug you). Last week I had one or more children at home Every. Single.Day. I had to make the call to school daily, sounding no doubt more and more unhinged as I laughed manically, “Me, again, you’ll never guess what….”. A friend tried to bolster me midweek when I described the week as a write off – “it’s only Wednesday!” she reminded me – yeah, you don’t have the parental power of insight that somehow lets you know optimism will be wasted here, you just need to give up, focus on next Monday and breath deeply. However, it had its surprises too. On Tuesday my son felt well enough to play so we made a train track, played Jenga, hide and seek, eye spy over lunch, had a teddy party and to top it off I taught him patience, a game I haven’t played for years and which reminds me of being little and poorly. We connected in a way that we never really do at the weekends when the rest of the family is around. We enjoyed each other’s company. Once I had come to terms with not getting a thing done, (and I mean not a thing of use – we all had fish fingers for supper) – it really was quite relaxing. After three days of course the playing vibe was threadbare. Money was chucked at the problem – a new comic, a jigsaw puzzle, and the latest Weird Oh book were grimly chucked into the shopping basket in an attempt to claw back some quiet time at my desk. And when the novelty of those wore off I turned on the TV. When I found him watching the ABC educational channel – about women’s working conditions in 1950’s Britain I almost frogmarched him to school. Clearly his mind was in dire need of sustenance. But then his brother was off the next day and the whole cycle began again. At least on Friday they were both off and managed, thank you universe, to play harmoniously – with the new toy monkey and another jigsaw. At least the local shops will be happy with me. So, unexpected though it was, the week wasn’t wasted as it both helped me have fun with my kids in a way I haven’t for ages and most definitely made me appreciate those precious few hours I have without them most days. In the week to come I imagine I won’t know myself. *While I wrote this very lightheartedly I do want to acknowledge that my kids simply had a virus. I can’t imagine what it must be like to care for and worry about a chronically or seriously ill child and honour and admire those parents who do. 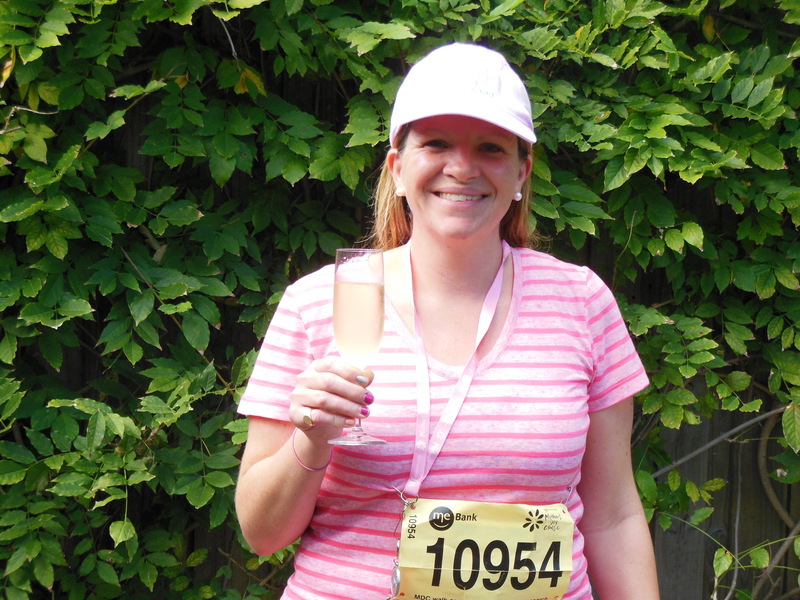 Running – and even walking – for cancer. This weekend will see me take part in the Mother’s Day Classic for the second year. Last year it was officially a BIG DEAL and I raised well over $1000 for a gorgeous wee boy with Neuroblastoma (Darcy has just had an MRI check up and things are looking really good, hooray). This year, despite giving up the vino again (and no-one is paying me this time! ), I am going to power-walk it as running hurts my poor old joints suffered too much (and yes, I didn’t start training soon enough, at all in fact). But I have made sure my jaw muscles are in good working order as I am walking alongside a friend with whom I could talk the hind legs off the poor proverbial donkey. But I thought to get everyone in the mood and to highlight the huge importance of events such as this in raising awareness, funds and support for those battling this hideous disease I would post my memories of my run last year, it was such a high. Thinking of all those this weekend for whom Mother’s Day (and every other day) is about so much more than breakfast in bed and bath salts – hold your families close everyone. 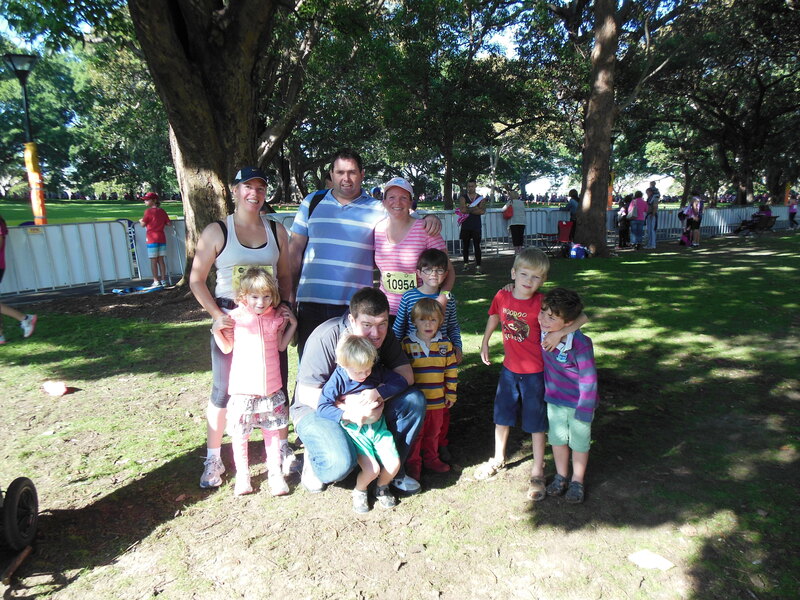 When I committed to participate in the 2013 Mother’s Day Classic around the Domain in Sydney I had no idea what to expect or whether I could even manage it. 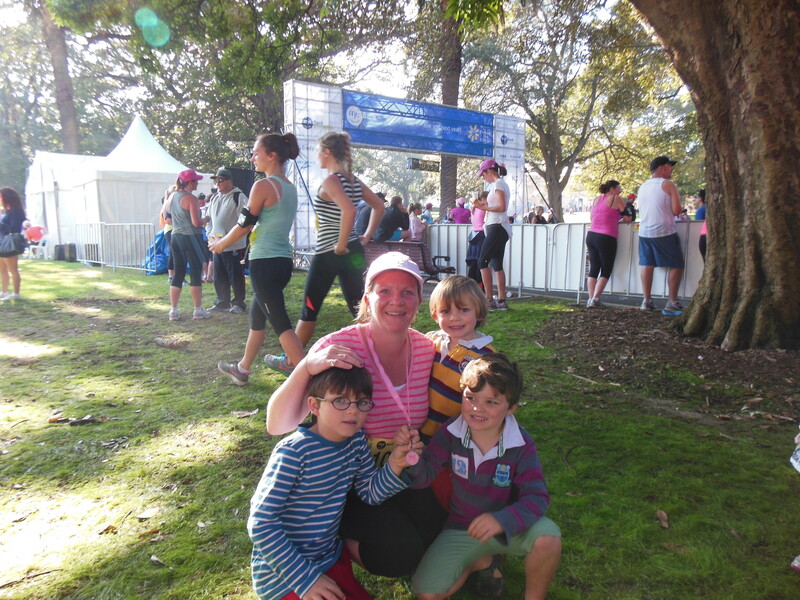 My goals though, were reasonable: to get around the 8KM run in under an hour and to raise as much money as I could for Darcy, a little boy I know who was fighting Neuroblastoma, a rare childhood cancer. All this was to be done after a month of intense training while also foregoing alcohol. I had never been one for setting myself rigid goals so, in order to keep me on the straight and narrow, I started a blog, meaning I was publicly accountable. That, and the interest and encouragement of my three young sons (the eldest of whom is Darcy’s age) kept me going through some tough times. Probably worth mentioning is the fact that I am practically allergic to organised sport. The last time I had seen the inside of a gym was before getting married (eight years before), when I employed the slowest setting on the X-trainer in order to read (and flash around) my bridal mags. Before that was the half-match I played for the U14 hockey team at school (such a novelty my darling Dad made a six hour round trip, really). I run around all the time in daily life but as far as real fitness goes I was definitely at the wrong end of any scale. Also, while I’m not ready to check into rehab, I do, like many people probably imbibe a little more than the guidelines recommend, so a whole month without was definitely daunting. I started confidently, walking early in the mornings before the getting-ready-for-school-rush began. I commended myself on my energy and knew this was in large part due to teetotal early nights. I enjoyed a casual Friday evening dinner with friends on nothing stronger than lime and soda and the next day to celebrate my clear head I got up early and ran, using my snazzy new watch to note time (long), distance (short), number of stops (too many). 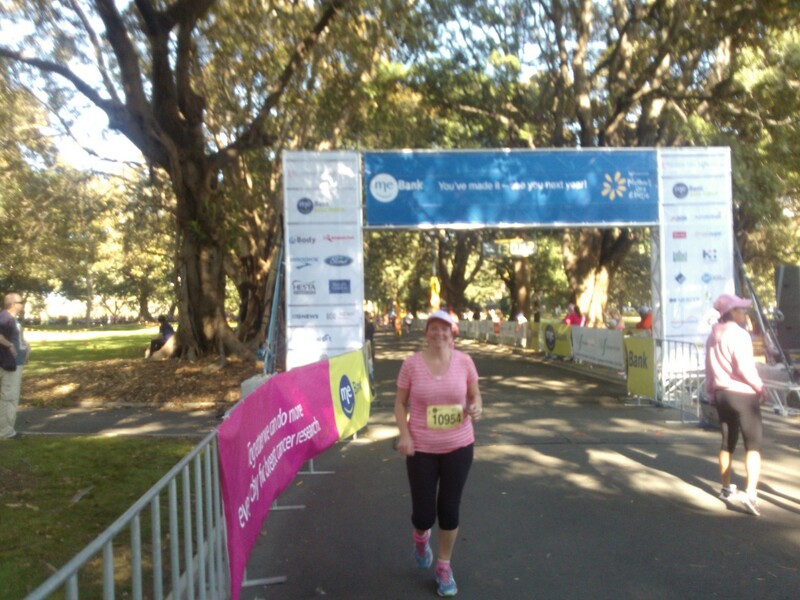 Despite the stats, I was thrilled, this summed up the new me – focused, energised and committed. 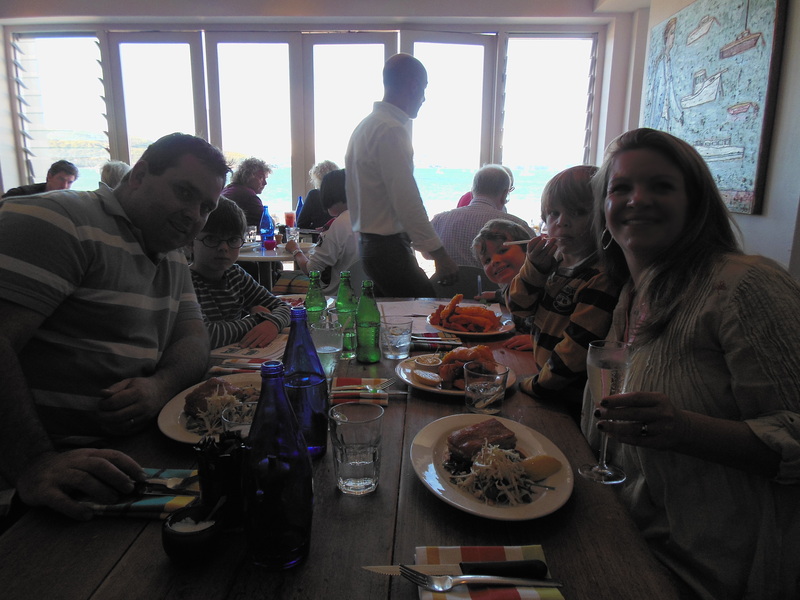 At a boozy Sunday lunch my craving for a G&T was strong but while everyone else got stuck in I meekly sipped mineral water and drove my merry husband home. Monday saw me undertake my most serious run yet. I ran for almost half an hour, half my target time. I was elated upon arriving home as a red, sweaty mess; I believed for the first time that I might actually make it round the course without requiring the attentions of the lovely people at the St John’s Ambulance station. On my blog I published a map of my route, my time, my feelings of jubilation. On Tuesday morning disaster struck. When I woke up my left ankle was the size of a balloon and it hurt, it really hurt. It reminded my six year old of an elephant’s leg; “You know Mum, how they go all the way down the same size?” Yes, I know. I wept, I railed against the unfairness of it. I hadn’t twisted it, missed my footing or done anything out of the ordinary that I was aware of. My husband gently applied ice and comforting words, going in late to work having taken the older boys to school. I felt idiotic and, more importantly, really worried that I was going to let people down. I had been making much of my self-imposed month of wholesomeness and the money had begun to roll in. I was getting as much of a kick out of every dollar donated as I had from my evening tipple. I was making a difference, and for that to be taken from me felt cruel. The only thing to do was to apply the RICE technique (rest, ice, compression, elevation), easier said than done when you have a household of boys to look after. I hobbled onwards; I played on the challenge of abstinence. In the remaining three weeks I managed only one more run of significance and that was not pretty. People were kind; it was for a good cause, I was still sticking to half the battle, as long as I made it round, even crawling, it would count. I exceeded the fundraising goal I’d set which only served to make me increase it. 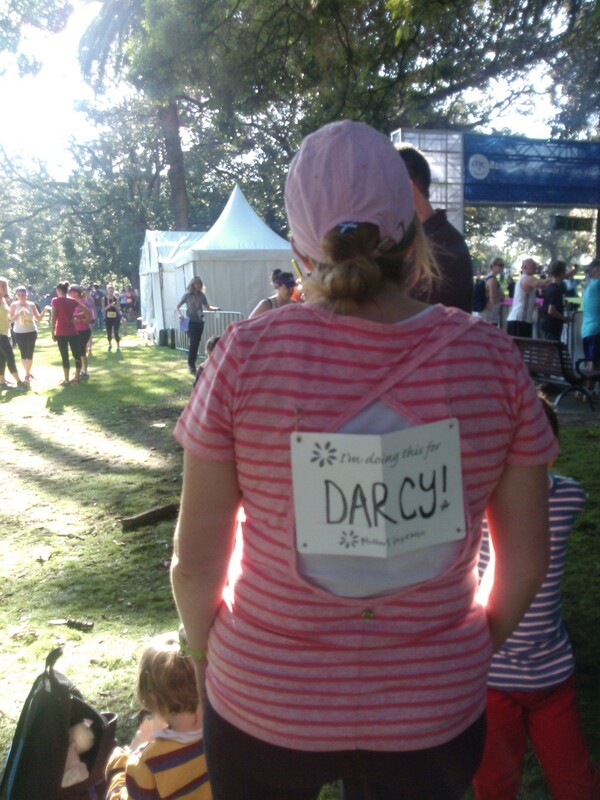 My boys asked almost daily ‘How much have we raised for Darcy?’ Were it not for their involvement, excitement and pride I doubt I’d have made the starting line. The day before the run I felt sick, I iced my ankle (once back from the boys morning activities, having made lunch, hung the washing out, you get the picture), laid out my running uniform complete with attractive new tubi-grips. I tried not to snap at the kids. I tried to sleep. I saw the dawn on the morning of the run and attempted to go along with the cheerfulness that was affecting the rest of the family as we embarked on this fabulous adventure. I wanted to shut myself in the loo and hide. We caught the bus and began to sense the atmosphere. The smattering of pink increased as we hurtled towards the city. Once there the rush was intense. The emotion was palpable and tears were never far away. Just reading the tribute cards pinned to participants’ backs was enough to set me off. I’ve always been a crier when nervous but weeping while in the queue for a portaloo at 7.00am was not something I had predicted. 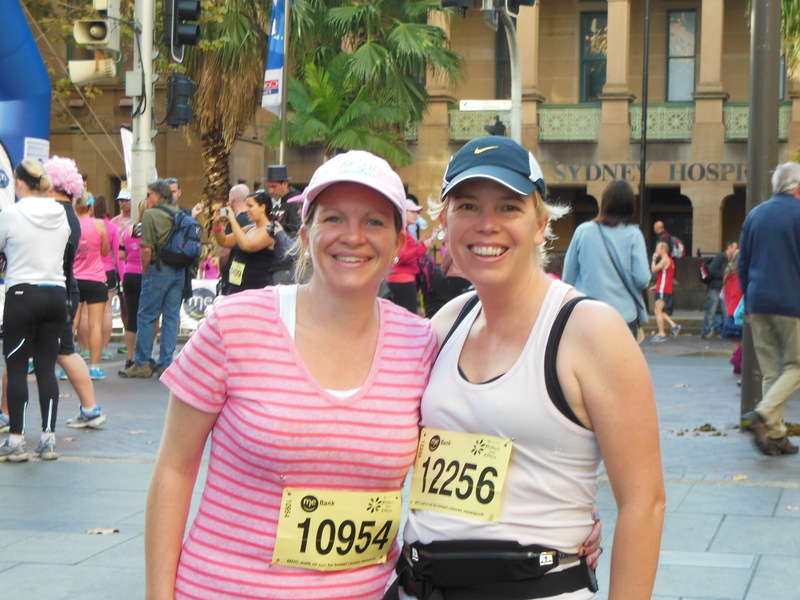 I found my friend who was running her third Mother’s Day Classic in memory of her Aunt and who was hoping to improve her record of 50 minutes. She propelled me to the start. I was shaking, afraid and utterly convinced that I could not do this. I hadn’t said a proper goodbye to my boys. I looked for them amongst the sea of faces but couldn’t find them. All of a sudden there was a hush and a countdown and we were off. I was running, I was there, it was happening whether I liked it or not. 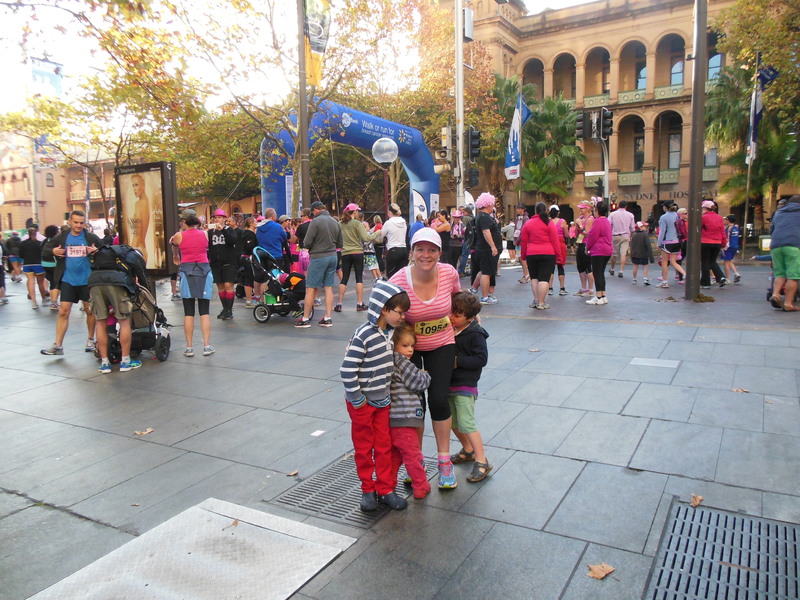 About 30 meters beyond the start I heard ‘Mummy, Mummy, go Mummy!’ and there they were, in a cleverly found gap. I gasped, I grinned and I galloped. I could do this; I would do it for them. The collective noise of thousands of tapping feet provided a metronomic effect. We were an army marching against an awful, strangulating disease. Thousands of families around the world are devastated on a daily basis as their hopes are destroyed and loved ones taken. Those hopes are never in vain and on that beautiful May morning that was writ large as memories and optimism in equal measure jogged alongside us. There was an eerie morning fog cocooning the harbour. Coming around the bend of Mrs Macquarie’s Chair the city rose like Atlantis from the deep. Angelic hosts appearing atop the rays of sunshine that pierced the clouds would have been in keeping such was the spectacle of the occasion and the setting. Embarking on my second lap was one of the very hardest parts. I had lost my friend long before; I was keeping my own pace and finding my own way. The novelty of the drinking stations had worn off (it was a weird experience seeing them holding out water for me, I wanted to look behind me at the real runner), I was being passed by what felt like hundreds of people and I was sore. My mind began to wander. I thought of the imagination of children when I remembered my five year old’s description of the weather including ‘fog drops’. I thought of Darcy what he and his family were enduring. 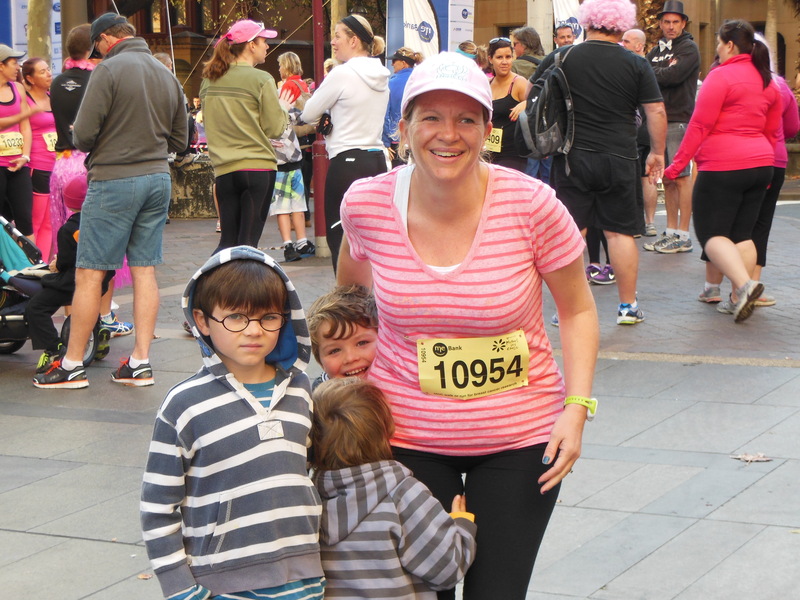 Then I passed my patiently waiting family and my boys began to run alongside me. 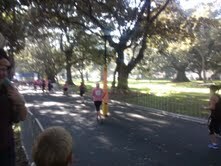 Suddenly I was at the 5km mark and I sensed possibility. I was in a bubble of determination; thanks to the fog and my family I refused to think of anything other than crossing that line. 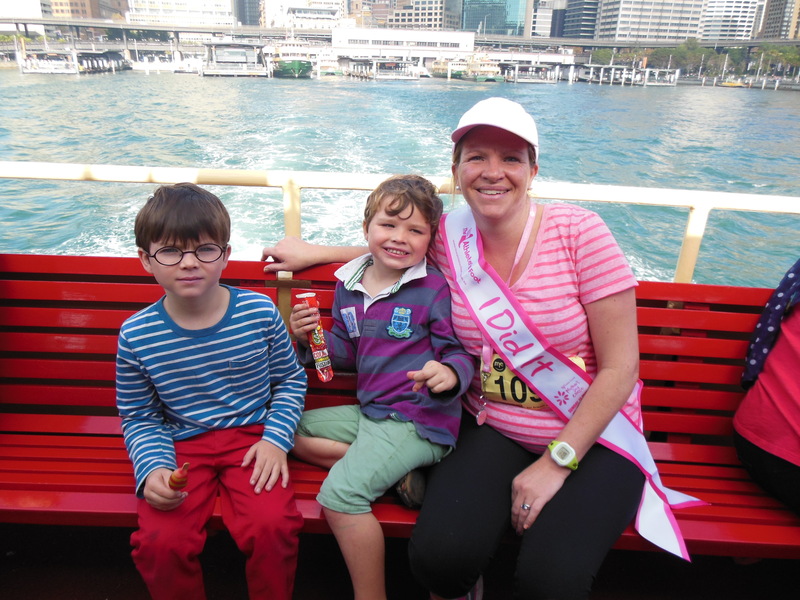 MDC 2013 – the best finishing prize ever. WE DID IT! Now what?! As the banner says, I did it! I managed to finish in just under an hour – awaiting the official result but by my watch it was 58.40 (7.11 mins per km – a PB!). Very happy with that given I did next to no training for the last two weeks leading up to today. What an amazing experience it was too. It was incredibly empowering to be a part of something so strong and so vibrant and humbling to read all the tribute cards. 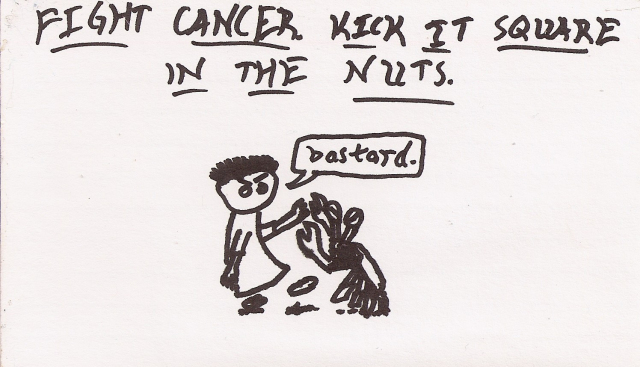 It’s easy to forget as we go about our busy lives that cancer could affect any of us at any time. It is our obligation to support those affected where we can and, when given the chance, to pull together to find a way to beat this terrible disease. Huge respect and congratulations to everyone who took part today and of course massive thanks from me to everyone who supported me, financially, emotionally, physically. Most of all my four amazing boys. Some photos from my day. With the boys at the starting line. My smile belies my dreadful nerves. Celebrating with the Kelly family. The journey home. We never tire of travelling to and from the city on the ferry, it still feels like an adventure. First stop The Source – loving BJ’s creative coffee labelling! First drink in a month, cheers! If you like to read writing written by someone who writes about reading but would really rather be reading. I am surviving mental illness one day at a time. Where have your shoes been? No tips, no advice, no routines, no philosophies - just a mirror on what you've become. Read it and weep.